This hearty chicken chili gets it's sweet-smokey flavor from the addition of Bush's Kidney Chili Beans, barbecue sauce, and spices. Happy Saturday everyone!! For me Football, cold weather and chili seem to go hand in hand. As soon as the weather gets cold, I immediately crave comforting soups, stews and hearty chili recipes. 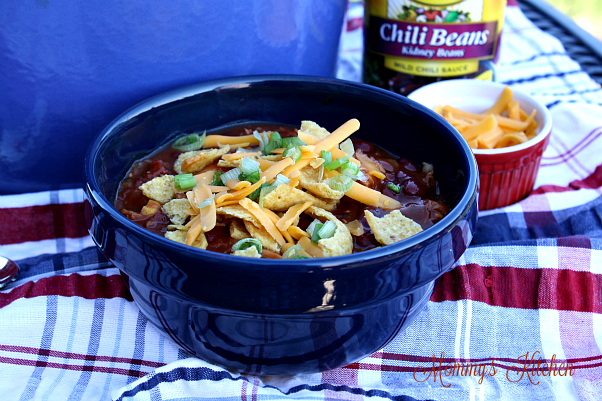 Chili is also the ultimate game day and cold-weather comfort food that everyone loves. There are several chili varieties and all of them are perfect for feeding any hungry crowd. It's definitely cold here in North Texas, so a big pot of chili was on the menu at our house last weekend. I love experimenting with different flavors, so recently I took a chance and tried my hand at a non traditional chili recipe that I think you'll love! I don't usually step out of my comfort zone when it comes chili , but this Barbecue Chicken Chili turned out so awesome I couldn't wait to share it with you. 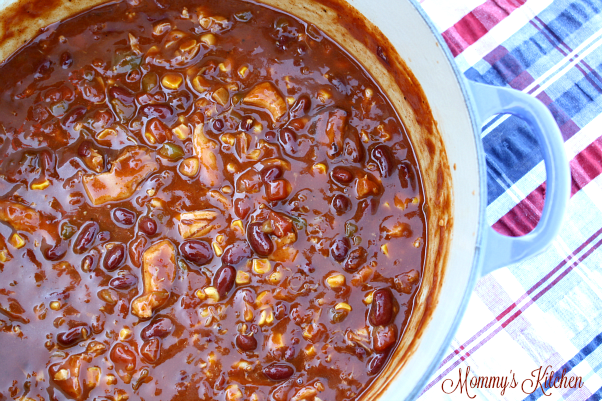 This delicious chicken chili gets it's sweet-smokey flavor from the addition of kidney chili beans, your favorite barbecue sauce, and a few spices. This recipe is simple to make and comes together in under 45 minutes with the help of a Rotisserie chicken and Bush's Chili Kidney Beans. I'm a huge fan of chili beans, so I was excited to hear that Bush's expanded their chili bean line with three new bean varieties, kidney chili beans, black chili beans, and white chili beans. Each one is simmered in a mild chili sauce with the perfect blend of spices. 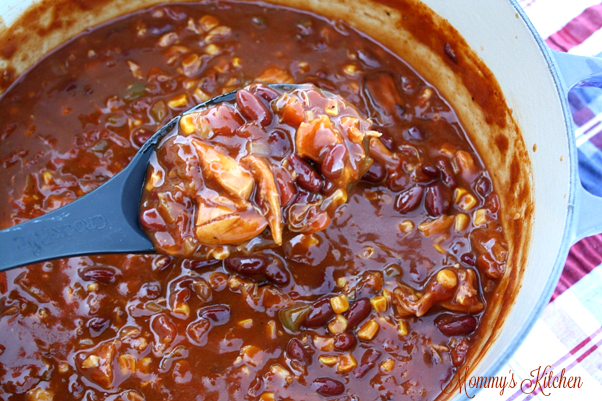 The kidney chili beans were a great starting point for my barbecue chicken chili. 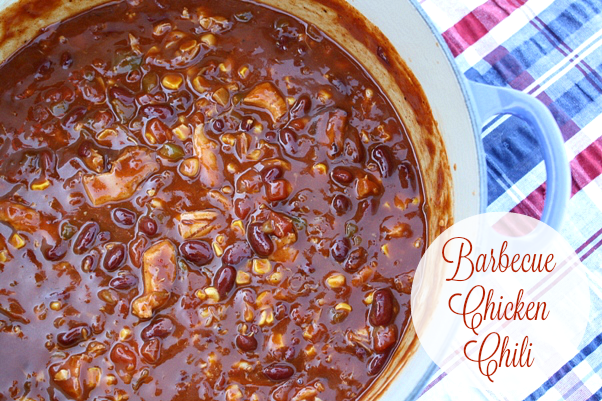 If you're thinking barbecue chicken and chili don't mix, I think you'll be pleasantly surprised, because it's really a delicious combination. 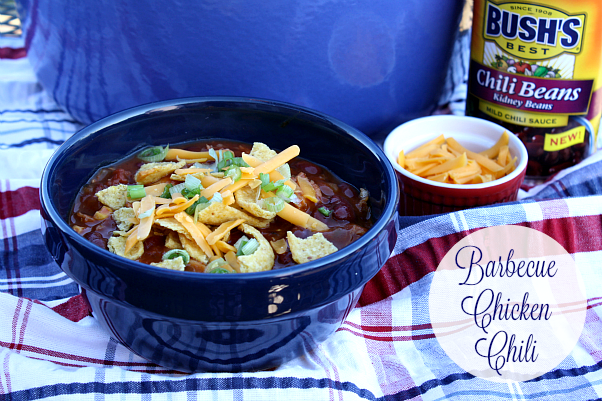 If you're looking for a hearty chili recipe for your Super Bowl get together, look no further! Before I go I also want let you know that The Daily Meal has teamed up with Bush's Beans, and Chef Jeffrey Saad to bring you some game time favorite chili recipes. Whether you're a pro in the kitchen or just starting out their Ultimate Chili Guide has everything you need to know about creating a winning chili recipe, so stop by The Daily Meal and check it out. Let's get started on this simple chili recipe. In a large pot or Dutch oven, heat the olive oil and saute the onion and green pepper until soft, about 3 minutes. Add the minced garlic and saute about 2 minutes until fragrant. Add the cooked chicken, mesquite seasoning, and smoked paprika, saute for an additional 1 minute. Add the diced tomatoes (including juice), kidney chili beans, chili seasoning packet, barbecue sauce, corn (drained) if using canned, and chicken broth. Lightly mix to combine. Bring the mixture to a boil, reduce heat to a simmer, cover and cook for 25 minutes to allow the chili time to thicken. Remove from heat, ladle into bowls. We like our chili served with corn chips, shredded cheese, chopped green onions, along side a skillet of cornbread. If you like things a little more spicy try my Moms Mexican Cornbread. In a large pot or Dutch oven, heat the oil and saute the onion and green pepper until soft, about 3 minutes. Add the minced garlic and saute about 2 minutes until fragrant. Add the cooked chicken, mesquite seasoning, and smoked paprika, saute for an additional 1 minute. Add the diced tomatoes (including juice), kidney chili beans, chili seasoning packet, barbecue sauce, and corn (drained) if using canned, and chicken broth. Remove from heat, ladle into bowls, and garnish with corn chips, shredded cheese, sour cream, chopped green onions, and cilantro. Cook's Note: This chili recipe is also crock pot and freezer-friendly. For more chili bean inspiration check out how my blogging friends are enjoying Bush's Chili Beans.